Close to 4,500 British soldiers had landed at Benedict, Maryland on August 19, 1814 and marched towards Washington, about 60 miles away. In the August heat, General Robert Ross did not push his men, and they took five days to cover the roughly fifty miles to Bladensburg. There was not a single trained American soldier in the vicinity to oppose them. All President Madison could do was call out thousands of untrained militia who were marching to confront the British in Maryland. 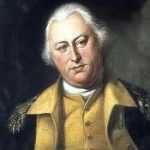 Their inexperienced commander was General William Winder, whom Madison had appointed largely because his uncle, the governor of Maryland, had already raised a sizable state militia. On August 22, 1814 President Madison set out for nearby Bladensburg, Maryland to assess the situation. On August 23, British General Ross received a message from Vice Admiral Alexander Cochrane, advising him to turn back. But Rear Admiral George Cockburn thought they should continue. After much discussion, Ross agreed. The Americans, after all, did not appear inclined to defend their capital. The villages they had passed through along the way had largely been abandoned. The road to Washington appeared to be wide open. My husband left me yesterday morning…. 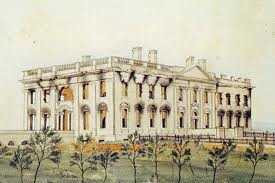 He enquired anxiously whether I had courage, or firmness to remain in the President’s house until his return, on the morrow, or succeeding day, and on my assurance that I had no fear but for him and the success of our army, he left me, beseeching me to take care of myself, and of the cabinet papers, public and private. I have since received two despatches from him, written with a pencil; the last is alarming, because he desires I should be ready at a moment’s warning to enter my carriage and leave the city; that the enemy seemed stronger than had been reported, and that it might happen that they would reach the city, with intention to destroy it…. Friends were urging her to leave the city immediately. By now most Washingtonians, many cursing their President for starting “Mr. Madison’s War,” were fleeing down Pennsylvania Avenue in every conveyance they could find, clogging the roads in the process. There was little sleep for Dolley; she spent the night of August 23 alone, except for a few loyal servants. …I have pressed as many cabinet papers into trunks as to fill one carriage; our private property must be sacrificed, as it is impossible to procure wagons for its transportation. 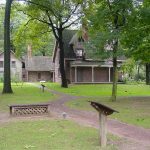 I am determined not to go myself until I see Mr. Madison safe, and he can accompany me… French John [a servant]… offers to lay a train of powder which would blow up the British, should they enter the house. To the last proposition I positively object, without being able, however, to make him understand why all advantages in war may not be taken. Wednesday morning, twelve o’clock – Since sunrise I have been turning my spyglass in every direction, and watching with unwearied anxiety, hoping to discover the approach of my dear husband and his friends; but, alas I can descry only groups of military wandering in all directions, as if there were a lack of arms or of spirit to fight for their own firesides! At about that same time, the British were entering Bladensburg, which was empty of American soldiers. On the heights across the Potomac River, the Americans were waiting. For some reason they had not destroyed the bridge! The British charged and quickly drove off the American riflemen, but then had to face the main body of Maryland militia. When the Americans counterattacked, the Redcoats were pushed back towards the river and most of their officers were killed or wounded. By now the main body of the British force were across the bridge. The British commander ordered the use of Congreve rockets. The rockets were extremely inaccurate, but they made a terrifying noise as they whistled over the heads of the terrified American soldiers who had never heard or seen anything like them. As an American sailor bluntly reported,” The militia ran like sheep chased by dogs.” President Madison retreated toward Washington, along with General Winder. Three o’clock – Will you believe it, my sister? We have had a battle or skirmish near Bladensburg, and I am still here within sound of the cannon! Mr. Madison comes not; may God protect him! Two messengers covered with dust come to bid me fly, but I wait for him….” At this late hour a wagon has been procured, I have had it filled with the plate and most valuable portable articles belonging to the house; whether it will reach its destination; the Bank of Maryland, or fall into the hands of British soldiery, events must determine. Our kind friend, Mr. [Charles] Carroll, has come to hasten my departure, and is in a very bad humor with me because I insist on waiting until the large [Gilbert Stuart painting] of General Washington is secured, and it requires to be unscrewed from the wall. This process was found too tedious for these perilous moments; I have ordered the frame to be broken, and the canvass taken… and the precious portrait placed in the hands of two gentlemen of New York, for safe keeping. And now, dear sister, I must leave this house or the retreating army will make me a prisoner in it by filling up the road I am directed to take. When I shall again write to you, or where I shall be tomorrow, I cannot tell. As Dolley headed for the door, she grabbed a copy of the Declaration of Independence from a display case and put it into one of her suitcases. As Mr. Carroll reached the front door, one of the president’s servants arrived from the battlefield on a horse covered in sweat. “Clear out!” he shouted; the British were only a few miles away. Dolley and Carroll climbed into her carriage and were driven to his family mansion, Belle Vue, in nearby Georgetown. The British reached Washington a few hours later, as darkness fell on August 24; they burned public buildings and scattered government officials and documents over the surrounding countryside. The 3rd Brigade were the first to enter Washington. American snipers fired on them from a house and killed a British soldier. The Redcoats smashed down the house’s door and discovered the snipers had fled, so they burned down the house with Congreve rockets in retaliation. The British soldiers then turned their attention to the Capitol building which was made almost entirely of stone and would not be easy to burn. The soldiers did their best, however; they chopped up shutters and doors and added rocket powder, eventually managing to start a fire in every room. The House of Representatives contained better fuel. That night British soldiers ransacked the President’s Mansion, smashing windows and piling White House furniture in the center of the various rooms. Outside, 50 of the marauders carrying poles with oil-soaked rags on the ends surrounded the house. When the signal came, men with torches ignited the rags, and the flaming poles were flung through the empty windows. Within minutes, a huge conflagration soared into the night sky. The pillaging of Washington went on for two days. A number of private homes also went up in smoke. On the second day, the British went to the offices of the anti-British National Intelligencer with the intention of putting it to the torch, but neighborhood women begged him not to because they feared the flames would spread to their own homes. Instead he ordered the contents moved out onto the street and burned. After the second day of the occupation, the inhabitants of Washington were ordered to remain inside to avoid the risk of death. New fuel was added to the fires to ensure they would burn all night. A freak storm suddenly erupted, with high winds fanning the flames and violent thunder and lightning. The shaken British commanders soon retreated to their ships. Meanwhile, Dolley had received a note from the president urging her to join him in Virginia. By the time they were finally reunited there on the night of August 25, the 63-year-old president had barely slept in several days. But he was determined to return to Washington as soon as possible. He insisted that Dolley remain in Virginia until the city was safe. The American government was virtually brought to a standstill, and many urged the president to move the government to a safer place. 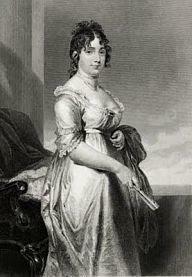 However, Dolley fervently argued that the Congress should stay in Washington, and the president agreed. 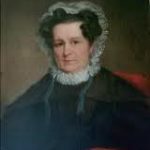 She persuaded the owner of a handsome brick dwelling on New York Avenue and 18th Street, known as Octagon House, to let the Madisons use it as an official residence. She opened the social season there with a reception on September 21. Dolley soon found unexpected support throughout the country. The White House had become a popular national symbol, and people were outraged when they heard that the British had burned the mansion. 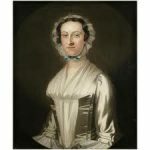 As newspapers reported her refusal to retreat and her rescue of George Washington’s portrait, a new respect and appreciation for the First Lady developed among her fellow citizens. However, the House of Representatives voted 79-37 to consider abandoning Washington. Still, Madison resisted. Dolley summoned all her social resources to persuade the congressmen to change their minds, by presiding over several scaled-down versions of her famous galas. For the next four months, Dolley and her allies lobbied the legislators, and both houses of Congress finally voted not only to stay in Washington but also to rebuild the Capitol and White House. With the new year came calls for the impeachment of Madison. On Saturday, February 4, a messenger reached Washington with a letter from General Andrew Jackson in New Orleans, reporting that he and his men had routed the British. New Orleans and the Mississippi River would remain in American hands! As night fell and the news swept through the nation’s capital, thousands of cheering citizens marched along the streets carrying candles and torches. On February 14, Henry Carroll, the secretary to the American peace delegation, returned from Ghent, Belgium, and Dolley urged her friends to attend a reception that evening. When they arrived, they were told that Carroll had brought a draft of a peace treaty, and the president was in his study, discussing it with his cabinet. The house was packed with representatives and senators from both parties. Dolley had shrewdly stationed her cousin Sally Coles outside the room where the president was making up his mind about the treaty to end the War of 1812. When the door opened and Sally saw smiles on every face, she rushed to the head of the stairs and cried: “Peace, Peace.” Octagon House exploded with joy. People rushed to embrace and congratulate Dolley. The butler began filling every wineglass in sight. Even the servants were invited to drink, and according to one account, would take two days to recover from the celebration. Overnight, James Madison went from being an impeachable president to a national hero. Demobilized soldiers were soon marching past Octagon House, and Dolley Madison stood on the steps beside her husband, accepting their salutes.